(Annapolis, MD)- Like their counterparts on Long Island Sound, the Chesapeake Bay also has its annual Spring One-Design series that takes place over two weekends. 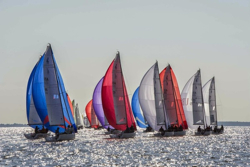 Hosted by Annapolis YC, series brackets the immensely popular Helly Hansen Annapolis NOOD Regatta. The Bay delivered good conditions to get off three races in each of the four J/Classes (J/22, J/70, J/30, J/105). Leading the sixteen-boat J/22 class with straight bullets is Peter McChesney’s THE CAT CAME BACK. Posting an equally impressive record was Jake Doyle’s ZESTY ENTERPRISE with a 2-2-4 for 8 pts. Then, sitting in third is JR Maxwell’s SCOOBY with a 6-3-2 for 11 pts. Following a similar theme as the J/22s for the class leader, the eleven-boat J/70 class saw Jenn & Ray Wulff’s JOINT CUSTODY post all 1sts as well to comfortably lead the fleet. Lying second is Henry Filter’s WILD CHILD with 7 pts and in third is Peter Firey’s PHOENIX with 11 pts. Ten boats are registered for the J/30 class but only seven made it to the starting line on the first weekend. Like their J/22 and J/70 colleagues, Doug & Amy Stryker’s TOTALED MAYHEM is leading with straight bullets. Behind them, it is a battle for the silver, with two boats tied on 10 pts each- Bon Rutsch’s BEPOP and Tristan & Sheila Keen’s INFECTIOUS SMILE. The fourteen-boat J/105 class has a tighter spread between 1st to 5th than any of the other fleets, perhaps a reflection of their three decades of racing one-design on Chesapeake Bay. In fact, three different boats won a race! Leading is a relative newcomer in the class- Ben duPont’s CTRL ALT DEL with a 1-2-3 for 6 pts. With a 4-1-4 for 9 pts, Cedric Lewis & Fredrik Salvesen’s MIRAGE is still within striking distance of the lead. Then, Jim Konigsberg’s INIGO started slow, but improved each race, posting a 6-4-1 for 11 pts to have a narrow lead over the next three boats for the final position on the podium. For more Annapolis YC Spring Series sailing information Add to Flipboard Magazine.